At my first post-op appointment, I was handed a survey, and the questions surprised me. The survey, of course, had the usual, expected questions: On a scale of 1-10, how would you rate your pain? How much has your pain affected social activities, house work, etc., etc. But the majority of the questions dealt with mental health. Have you felt like a failure? Depressed? You're handed the survey at every post-op appointment—to track progress, I guess. The first time I answered the questions, I was okay, really. (I've learned to be 100% honest with those types of questions, despite the discomfort). The first week after surgery, I was too focused on the physical challenges and pain to think about how I was being mentally. But the next time I filled out the survey, at 3 weeks post-op, I noticed my answers starting to inch toward what could eventually turn into a depression diagnosis. Or, more accurately, flare-up. 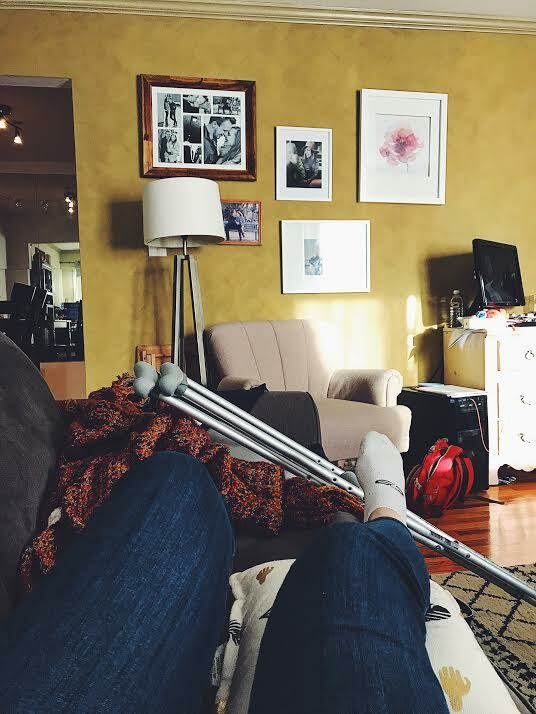 I've never had an injury that's kept me off my feet for 6-8 weeks, so I had no way of preparing myself for how it could impact my mental health. What was coming? I had no idea. But now having gone through it, I know taking care of mental health during recovery is as important as going to physical therapy for the injury. I missed one of my best friend's weddings, one I was supposed to stand up in as a bridesmaid, 'cause of the surgery. Another friend from my old job was getting married that weekend. And following the blood clot diagnosis, the possibility of having to cancel our trip to Alaska over Thanksgiving became clear. Does it ever end? Tim and I asked. Can't we just have one smooth-sailing year? And, when by myself, I've felt sad, angry, disappointed, and guilty. Since the last week of September, I've spent a decent amount of time around people in pain - I've heard people vomit in emergency rooms. I've rolled past nervous family members in waiting rooms. I've witnessed a whole slew of people in pre-op, waiting for their doctors to work their magic so they don't need to see the likes of another operating room. I've crutched past people who were vocally struggling to get one leg behind the other in physical therapy. I've moved my crutches out of the way for people as they limped to get their labs done. And I've waited to see the hematologist oncologist as women with headscarves and somber faces waited for the elevator. And every time I've found myself among their company, I couldn't help but wonder about their prognosis. I've begun to ditch my crutches. My right leg is slowly learning how to walk again. I made dinner this week. I baked muffins this morning. My kids, for the first time in 2 months, will be home with me on Monday. With time, I'll be able to carry loads of laundry up and down stairs without a second thought. Life is getting back to "normal" (whatever that means anymore). So there is a beaming light at the end of the tunnel for me, a light that I'm not sure is shining for all the people I've come across over the last 7 weeks. After trying to gain a few solid coping mechanisms throughout these past couple months, I'm here to report I've found...none. I know that thinking someone else's suffering is worse than yours isn't the healthiest way to deal with your own battle. Just because someone has it worse, doesn't mean you're not hurting my husband always tells me. It's important to acknowledge whatever you're dealing with and to properly work through it, and saying it's not as bad as x, y, or z is not the proper way. But I haven't known any other way to get through these last weeks except to be grateful that my injury is only temporary. And to think (and to often be visually reminded) that so many others have it..worse. How could I not just be grateful that there is at least an end in sight? The other night in physical therapy, there was a woman being treated after three consecutive injuries. She was there for another. I sat there with the heat pack on my knee, and just thought if you're not one of these people in and out of hospitals, waiting, questioning, hurting, you're one of the lucky ones. It's really amazed me, over the past couple months, how many people are in pain, how that life of in and out of doctors and hospitals is their "normal". I eventually couldn't help but feel guilty after becoming frustrated I wasn't able to walk. It's an unfortunate part of life—that we take for granted so much that is in front of us. Our health, our family, our spouse, our friends. Because as the saying goes, it can all be gone in an instant. This is not to end the week before Thanksgiving on a Negative Nancy low note, quite the opposite, actually. I'm so grateful for my health and family in this moment, that I felt compelled to put it out there to the Universe that you should be grateful for yours, too.